Samsung began producing washing machines and refrigerators in Europe during 2010 when they opened a production facility near Poznań (Poland). Today the plant produces over three-million units annually, and one in two are made with steel from ArcelorMittal Europe – Flat Products. 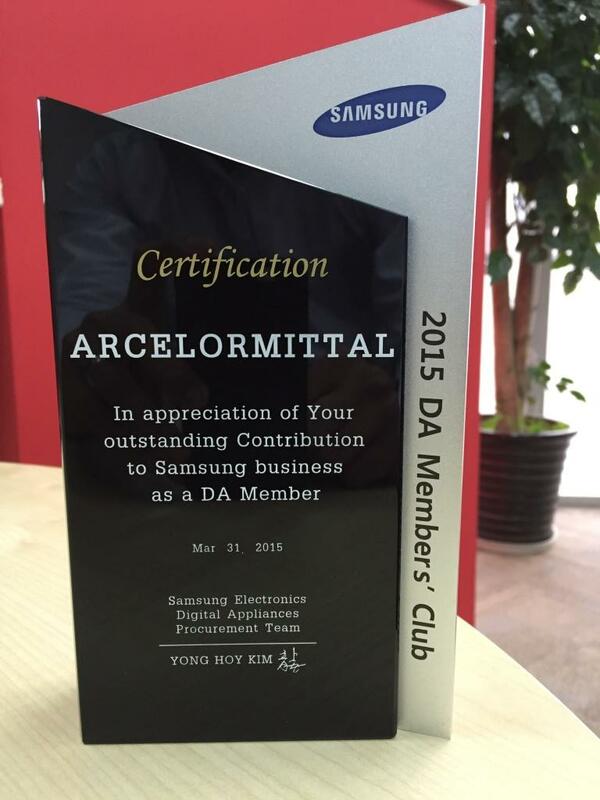 In 2015 ArcelorMittal received Samsung’s Best Partner award, and cooperation between the two companies has intensified ever since. Before a steel can be used by Samsung, it must go through an extensive testing programme which involves both the local plant and head office in Korea. That begins with a sample of the steel being sent to Korea where it is checked to ensure it matches Samsung’s colour palette. In the eight years since the Poland facility opened, Samsung and ArcelorMittal have undertaken more than 100 such steel approvals. Today Samsung uses a wide range of ArcelorMittal grades including hot dip galvanised, hot and cold rolled, and organic coated steels. A trial of Jetskin®, a homogenous metallic coating which offers excellent corrosion protection – particularly for indoor applications, also started at the end of 2017. Samsung is one of the world’s leading suppliers of electronics and home appliances. The company operates production facilities around the globe. Samsung Electronics Poland Manufacturing started producing refrigerators and washing machines in 2010. In its first year, the plant made almost half-a-million products. Production has increased each year to reach 3.2 million units in 2017. Key markets include Europe, Russia, the Middle East, and Africa. ArcelorMittal's Estetic® Casa range includes four grades which offer appliance makers different levels of visual finish, mechanical properties, and corrosion protection. Estetic® Casa Access: The cost-effective solution for quality built-in appliances. Estetic® Casa Classic: Designed for applications where standard corrosion protection is required. Estetic® Casa Protect: Offers improved corrosion protection and detergent resistance with maximum flexibility. Estetic® Casa Visual: Combines protection, flexibility, and hardness with aesthetics. Opens new creativity options as aspect, gloss, and finish can be controlled.